This comment here, set me off to find which constituency I belong to. It turned out that there's not one, but three. That's because there are three elections in which we vote - Bombay Municipal, Maharashtra State and the General Elections. Numbering: Electoral Wards are numbered 1 to 227. Administrative wards are from "A" to "T"
For example, Pali Hill and Lilavati Hospital are both in Bandra. But Pali Hill falls under electoral ward no. 96 and Lilavati Hospital under electoral ward no. 97. And both wards (nos 96 and 97) fall under Ward H/West. So, there are 227 electoral wards (and hence 227 councilors) clubbed under 24 administrative wards. The electoral wards are numbered 1 through 227 and the administrative wards are numbered A through T.
To know which electoral ward you stay in (it will be numbered between 1 and 227), read my earlier post on the BMC elections. Or, if you're willing to put in the effort, download this very detailed powerpoint presentation here, which gives the boundaries of each and every electoral ward. The presentation has (obviously) 227 slides and is in Marathi. Looking at the above, it makes sense, doesn't it? Locality, City and Country. I have the right and duty to vote for the person in charge of all three. If you look at any political party poster in your area - and assuming they all belong to the same party - then you'd probably find the mugs of the Municipal Councilor, Member of Legislative Assembly (MLA) and Member of Parliament (MP) on it. To put things in perspective, Mumbai has 227 councilors in the BMC, 34 MLAs in the State Assembly and 6 MPs in the Parliament. These are the people you elect, these are the people responsible for your area and these are the people who represent it in the Municipality, Assembly and Parliament. Would you pay Mr. Adolf D'Souza Rs1 per day? A group of residents of a common locality used to meet often with a mutual interest of maintenance, cleanliness and general well-being of the area where they all stayed together. You know, the usual things, roads, drains, etc. So, they formed a common group for the welfare of the area they all stayed in. You’ve seen this so many times in Mumbai. Residents of say, one road in say, 10 buildings form a group. The group would then meet with the BMC (Bombay Municipality Corp.) and take up matters. Drains are clogged, garbage’s not been picked up, etc. In some cases – like waste management – the BMC helped them out. In others – like drainage work, road repair, etc. – they resisted. After all, if the residents are going to do all the work, then what good are the elected Municipal councilors?. But our group persisted and managed to get their work done using the law (think RTI). Seeing this, other people from near-by roads and neighbourhoods also formed their own groups, with the help of the first group. They began solving their problems, using the law, working with the BMC. The BMC figured that if you can’t beat them, join them. So the BMC's engineers (looking after roads, drainage, etc) began meeting up with these groups and together, they worked their way around problems of the area. Till one fine day, these groups figured they’d be better off if someone among them is elected into the BMC. Why fight the system if you can change it from within? Especially when a person who you trust, who is part of your group and who has delivered is also now willing to represent your area in the BMC? And so, the message goes across all the groups in all the roads in all the neighbourhoods. "Vote for Mr. X as your representative in the Municipality". A systematic campaign at the grassroot level begins, backed by internet-driven efforts, e-mails, wikis, and what-have-yous..
Mr. X wins. The campaign has worked. A victory for democracy and a case-study for the effectiveness of public involvement in civic matters. So far so good? Just one small problem now. Mr. X is not supported by any political party. Ah, politics. No getting around it, is there? Look at the rest of the BMC – don’t all of their people belong to a political party? Almost all of them do. But why does it matter if Mr. X. doesn’t belong to any political party? Here’s why – the BMC pays Mr. X Rs4,000 per month for his salary and his office’s running expenses (i.e. staff, stationery, etc.). If Mr. X belonged to a political party, all this would be booted by the party itself. Currently, I am a ward committee chairman, so BMC has provided me with a car and staff. But my tenure as committee head ends next year, and I will not be able to manage expenses because I will have to bear all costs on my own. Why doesn’t the corporation increase the amount given to corporators? This will also help reduce corruption. Why indeed does it not? But come on, the BMC is not going to raise councilor salaries in a jiffy, right? Besides if all the political parties take care of their councilors, then why should the BMC raise salaries across-the-board for one candidate? So, any ideas on what should be done? Try this: Ask the people who elected you – about 4,000 in all – to pay about Rs1/working day towards his salary. Which works out to..lets see…Rs1*25 working days*4,000 people = Rs100,000. Rs1lakh a month. That sounds better. Enough for an area as large as Ward 63 – or that part of Juhu that got together and elected Mr. D’Souza as their Municipal Councilor. My question to you – if you were a resident of Juhu, if you had elected Mr. D’Souza to office and if you believe in his execution capabilities, would you pay this man Rs25 per month? Not everyone will. Read these reactions (from today’s DNA). Candy Cornello - How did other independent corporators before Adolf D'Souza manage their office? If the BMC really underpays its people, how come none of the corporators have raised their voice yet? I don’t mind paying the corporator Re1 a day, as it is hardly going to burn a hole in my pocket. But it's unwise on the corporator’s part to ask funds from people instead of the BMC. Mauren D ’Souza - Mr D'Souza is abusing democracy by asking Juhu voters for help. Why did he take up the job if he was not capable of delivering? The BMC must be having certain standard of payments that were followed by corporators till date. How come no other corporator complained? Re1 is a paltry sum. But what is the guarantee that he won't take bribes apart from this money he will 'collect' from us? If I have my math right, D'Souza is asking for a bit too much than actually needed. If the BMC can't pay them for their services, they should seek employment elsewhere. These people are asking valid questions. Somehow I can't see it in such black and white. Sure, I have no idea how other independent Municipal councilors/corporators have managed all these years. Just like I have no idea how effective these other councilors/corporators were and what their track record was. But I do know that Mr. D'Souza has a decent track record. Sure, I can file an application under RTI with the BMC to find out how the taxes they collect from me are spent. But will that reveal anything path-breaking? Besides, I already know that councilor/corporator salaries are Rs4,000/month (plus Rs150-600 per meeting). So I'm not sure how effective an RTI application would be to work around this situation. Now, what if Mr. D’Souza were to resign because of lack of funding? And in place of him, is elected someone from a political party; someone I don’t know and someone likely not endorsed by local citizens groups. In other words, same old, same old. What then? He could deliver and then again he couldn't. Why should lack of funding stop a good man from doing his job? Will he really set a precedent for others? I think the public would know enough to spend their money on someone who delivers, as against a rank outsider. Besides, I doubt whether a councilor from a political party would ask us money for his salary. Purely from the maintenance and development of the area where I stay and purely from my support for this individual, if I got an email asking for Rs25/month to help pay for his expenses, I think I would pay up. Update - If you have not received your voter ID card, please read this first. Note - I've received a lot of comments on queries pertaining to schedule, forms, etc. 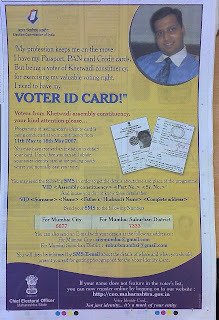 For all these matters, could I request readers to please keep checking the Chief Electoral Officer, Maharashtra's website for details on the voter photo-ID program. (b) Read these FAQs here. Update- Parel (Assembly Constituency #28 has been added to the list. If you stay in Parel, check the EPIC schedule for that area here). For those who missed out on voting in the BMC elections, here's your chance - a full two years in advance - to ensure that you don't miss out on voting in the 2009 Elections in Maharashtra. Did you notice this while reading your newspaper today? The State Election Commission has initiated a commendable drive to issue your Elector Photo Identity Card (EPIC), or simply Voter ID card, on the spot. That's right. I got mine done in just under 15 minutes, by going to the local Election Registration Office (ERO). While you are supposed to get an notification slip at your home with your name, ERO address and further details on how to get the EPIC, chances are - as they were in my case - you might have not got this slip. Of course, chances are you might not even be on the Electoral Rolls (more on that in a later part of this post) but neither of these issues are big problems. Read further on how to tackle them. The EC is currently holding the EPIC program in four constituencies (Chembur, Nehru Nagar, Mulund and Khetwadi). 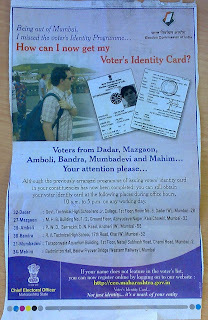 Earlier, it has completed the drive in six other constituencies (Dadar, Matunga, Amboli, Bandra, Mumbadevi and Mahim). If you belong to any of the eleven constituencies mentioned above, here's the checklist for getting your EPIC. 1. First and foremost, check if your name appears on the Electoral Rolls. Don't groan. You can do this online. Go here and click on the "SEARCH ELECTORAL ROLLS" tab. 2. If your name appears correctly on the rolls, then go to point 4 below. 3. If there are any problems in your name then click on the following links to apply ONLINE (yes, online and not go to any office)..
4. After your name is included on the rolls, you have to go to your local election office. A> If you belong to the following constituencies, click on the link to view a detailed schedule of the program in your area. Each area has multiple EROs. Go to any one of them with proof of identity and residence (ideally a ration card, drivers license, passport, etc), and that's it. You should be issued your EPIC by the (very helpful) election staff at the ERO. B> If you belong to the constituencies below (where the drive has already been conducted), you can still get your EPIC. I've given the ERO address (same as in the third ad above) next to the constituency name and number. Just walk in to the ERO with proof of ID/residence (ideally a ration card, drivers license, passport), and you should get your EPIC at these EROs. Mumbadevi (AC 21) - Taraporwala Aquarium Building, 1st Floor, Netaji Subash Chandra Road, Charni Road, Mumbai - 2. This is one of the most comprehensive efforts undertaken to increase voter registration. I've never seen a simpler, voter-friendly way of getting the EPIC (which, btw, is as important a document as your passport). I've tried the system and it works. Now you try it. In fact, if you believe that others should know more about this, then spread the word. Thanks in advance. Time for a reality check on the Bandra Worli Sealink. I've taken these photos from five different locations - Worli Sea Face, Twin Towers (Prabhadevi), Chaityabhoomi (Dadar), Bandra Reclamation and finally, Band Stand. For a brief recap on this ambitious - and long-delayed project - do read my earlier post here or visit the project's website. Quick facts - Its a 6km long road which will connect Bandra Reclamation to Worli Seaface. It is slated to cost about Rs1,306crores and is (as its signboard will tell you) expected to be completed a year from now, i.e. April 2008. If this does get completed on time, the present Congress+NCP Government will use it as a poster boy for vital Mumbai infrastructure that they completed during their tenure. Of course, the utility of the BWSL has always been - and will continue to be - debated. Put simply - how can a project, which is clearly in favour of motorists, be justified, when precious little has been done to boost Mumbai's local trains? And then of course, there are concerns on the environmental impact of the BWSL. Anyway, I'm not touching on these aspects as I've already covered parts of them in earlier posts. This post is specifically on the photos and the progress underway on the project. Note - if any of the photos look hazy, please click on them for an enlarged views. If any of you readers are kind enough to improve the quality of the photos (I've just touched them up using "I'm feeling lucky" on Picasa), I would really appreciate your help. Picture 1 - This is what you see if you're standing on Worli Sea Face. One platform jutting out from the road. This is the point of entry/exit to the BWSL from Worli Side. Initially, the flyover over Love Grove was supposed to connect the BWSL to Haji Ali, but I'm not sure if this is the case now. Picture 2 - Another photo from Worli Sea Face. We'll soon see how this looks like from other places in Mumbai. Picture 3 - I'm now near Twin Towers and in this photo you can see the same cranes you saw in the earlier photos. This is Worli Village. Picture 4 - So, this is essentially the work done from the Worli Side on the BWSL. Not much. Wait till you see Bandra. Picture 5 - For example, this stretch of road looks weird, detached as it is from Worli Sea Face. Picture 6 - We're now at Chaityabhoomi, Dadar Beach. This is a view of Worli village and you can see some cranes in the background which are the same ones you see in Pictures 1 and 2. Picture 7 - This is really the progress on the BWSL and what stands of it as of now in May 2007. Notice the stretch coming out of Bandra Reclamation. The entire project is due to be completed by May 2008. Will it? Watch this space. And yes, I wish I had a better camera. Picture 8 - The central tower of the BWSL, which I think will be 128metres high once it is complete. Picture 9 - The work from the Bandra side. You can see both hotels - Sea Rock and Taj Land's end in the background. We're headed there in a bit. Picture 10 - This is what you see if you're at Bandra Reclamation. Note the central tower, with green covers on top and the strip of road, seen in picture 5 above, from the Worli Side. Picture 11 - The entrance at Bandra Reclamation, entry beyond which is currently restricted. The signboard says it all. 30th April 2008, 4.7km (I think this is just the stretch of road from Reclamation to Worli Sea Face, while the additional 1.5km is the distance from the Bandra main signal to this entrance at the end of Bandra Reclamation). Picture 12 - In this photo, you can see clearly see the ramp which leads up to the link. So, the entire stretch of road on Bandra Reclamation (i.e. the same road where so many movies have been shot) is connected to the sea-link. A lot of the construction trucks ply here everyday. Picture 14 - End of the road. This is the view from the Band Stand point, note that platform stretching out from the bottom of the pillars to the central tower (green cover on the top). Wonder what's that for.